In the period of a week it is not unusual for several noteworthy things to happen. Yesterday evening Abigail and i went to chat with the activist astrologer Caroline Casey it was quite and curious chat – the most engaging part for me was when she spoke of the real structures that were born of mythical origins. Blog post to come. Roberto and i did the second liberal transparency at Acorn and i have not felt since the last time i was doing direct action in eastern Europe like i facilitating anything so powerful and transformative. I got to watch as relationships shifted and people saw sides of each other that they had not seen and old silences and stumbles were cleared and new possibilities arose. They have yet to come up with a name for their group, so i call them “Not Not Forum”, because we already have a “Not Forum” transparency group at Twin Oaks, and this group is not that group. Roberto wisely hates this name. And after i came home from Not Not Forum, there was a hammocks push. Shal was pretty sure we could not make it, but foolishly (since he has been doing this for decades) i thought otherwise. And thru some combination of commune magic (which includes perhaps some bad accounting, an extra ordinary effort and some piece minor mystery) we were able to meet the goal and avert quota going up another 1.4 hours a week. We still hold to some vestiges of behaviorism. 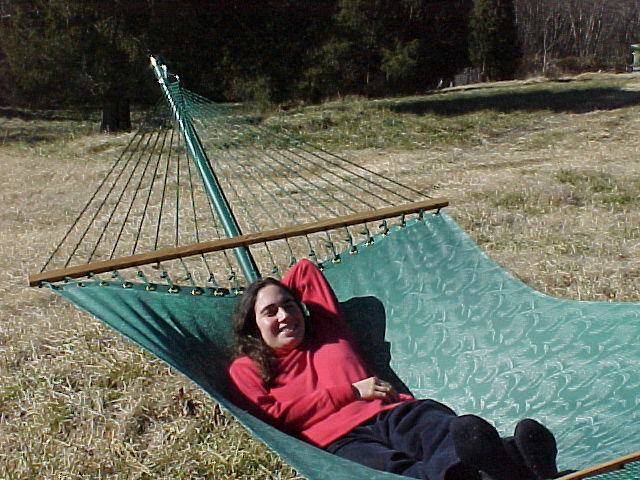 Because we were consistently failing to make the hammocks goals, for the last month we have linked failure to make our production goals with increases in quota. We have had “binding goals” if you will for the last 4 weeks, if we make them, all is fine. If we fail, then quota goes up 1.4 hours a week (0.2 hours/day). Last week we failed for the first time, and we started this week off slowly and it looked quite like we might fail again, increasing quota another 1.4 hours/wk. This evening when i breezed in about 9:30 PM there were still 14 hammocks to make. The shop was buzzing and Shal was doing his coordinating flow magic making sure all the work matters and fit into the intermediate pieces needed to progress. Just before 1 in the morning a handful of members pulled the last hx off the rack. How about combining funology and behaviourism to come up with some kind of positive rather than negative ‘encouragement’ to meet quotas? Just a thought. @John: The RPM (which is the general manager group for the hx business, which i am on) has proposed to the Planners, that when we make our goal we drop quota by an hour. THis is more reqard like. Certainly some funological tools have been attempted (hx dates, events in the shop, etc). But none of those seemed to be as effective as the “stick” of increasing quota when we failed to make the goal. And we are not done working the problem. It occurred to me afterwards that sometimes the achievement of meeting a hard quota or getting things done just in time is a reward in its own right. I guess it just depends on how people want things to operate. So glad you are feeling fulfilled in the powerful work you, Roberto and others are doing. I wish we lived closer and I could contribute more regularly to this transformative revolution of the heart.